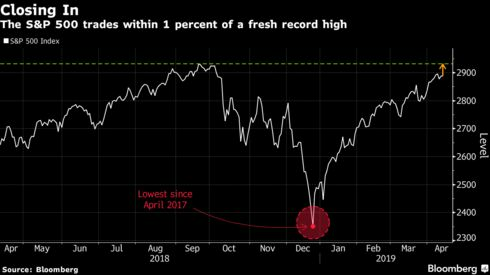 With Chinese trade and lending data showing signs of improvement for the world’s second-biggest economy, investors are turning to the U.S. earnings season to confirm the resilience of corporate America in the face of numerous challenges to growth. JPMorgan Chase & Co. posted strong first-quarter results. Up next are Goldman Sachs Group Inc. and Citigroup Inc. on Monday, and Bank of America Corp. on Tuesday. Elsewhere, emerging market stocks resumed their rally, heading for the 12th gain in 13 sessions. In currencies, Korea’s won jump the most since January. Earnings season rolls on this week, with reports due from: Citigroup, Bank of America, BlackRock, Goldman Sachs, Morgan Stanley, American Express, Johnson & Johnson, Netflix, IBM, United Continental, PepsiCo, Honeywell, Alcoa and Taiwan Semiconductor. The Stoxx Europe 600 Index fell less than 0.05 percent as of 9:14 a.m. London time. Futures on the S&P 500 Index fell 0.1 percent to 2,910.50. The MSCI Emerging Market Index climbed 0.1 percent. Topix index gained 1.4 percent to 1,627.93, hitting the highest in almost 19 weeks with the first advance in more than a week and the largest rise in two weeks. The Bloomberg Dollar Spot Index fell less than 0.05 percent to 1,192.32. The euro climbed 0.2 percent to the strongest in more than three weeks. The yield on two-year Treasuries gained less than one basis point to 2.39 percent, the highest in more than three weeks. The yield on 10-year Treasuries fell one basis point to 2.56 percent. Germany’s 10-year yield advanced one basis point to 0.06 percent, the highest in almost four weeks. Gold decreased 0.3 percent to $1,286.64 an ounce, the weakest in more than five weeks. Brent crude declined 0.1 percent to $71.46 a barrel. Platinum decreased 0.9 percent to $890.50 an ounce, the lowest in more than a week.